Los Angeles Mom Blog– Do Tell, Anabel! It's National Financial Literacy Month! 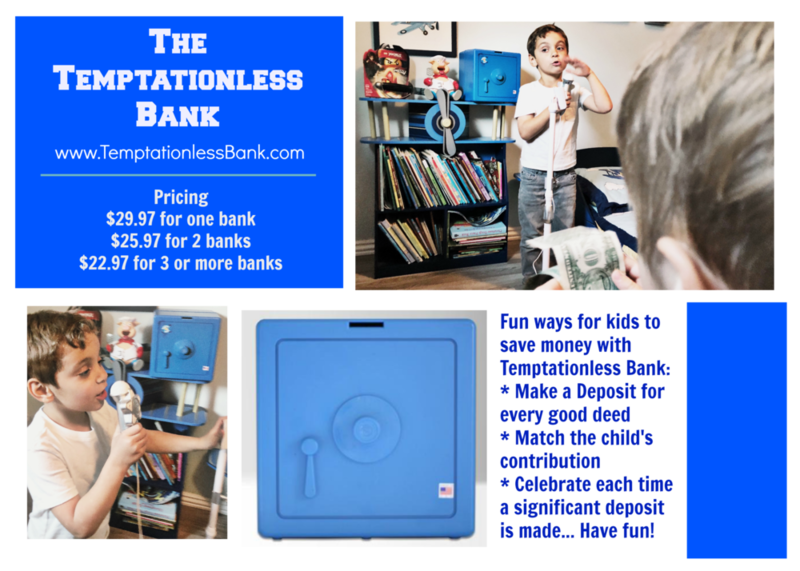 The Temptationless Bank Helps Kids Save up to $40,000! Thank you Temptationless Bank for giving us an opportunity to try your product. This is a sponsored post. All opinions are my own. It's often hard to figure out a way to teach kids about saving money. Heck, I'm not that good at it myself! But I know one thing's for sure, I don't want Benny and Toby to make the same financial mistakes I've made throughout the years, like incurring credit card debt and taking part in unnecessary spending. I want my sons to learn about savings so that when it's time to make big purchases that matter, like buying a car, paying for college or even buying a home, they're well prepared. Well, there's an awesome product called the Temptationless Bank that allows kids to save up to $40,000. Yes, that's right... $40,000! Photo of the Temptationless Bank inside Toby's room. The Temptationless Bank is a sturdy, colorful coin bank in the shape of a box that looks like a small safe. It's available in three different colors and has an slot for kids to deposit bills or coins and it's practically impossible to open. As a matter of fact, in order to retrieve the money inside, parents would actually have to saw it open... isn't that great? So how did I get my sons to start saving? We used the Temptationless Bank and held a "toy auction" in Benny's Room! The idea here was to remind Benny about the importance of cleaning out his closet and getting rid of toys he no longer uses. Also, to encourage him to make money out of his old toys and save proceeds from his toy sales to allow his savings to grow! Since our Temptationless Bank is still far from being filled, we used it to play and save by hosting Benny's toy auction inside his bedroom. My younger son Toby was the sole bidder. A toy auction seemed perfect in order to start clearing Benny's room from old toys. Toby "placed bids" on his favorite toys, which included plastic cars, board games with missing pieces and an old a burger-eating Piggy. Benny accepted all of Toby's offers and deposited the payments inside his Temptationless Bank (Mom made sure that once the toys were "purchased" by Toby, they were removed from Benny's bedroom...for good). Prior to the auction, Benny had been depositing a combination of bills and coins but he still has a long way to go before it reaches cash capacity... lol. Generally, it's recommended that parents find a stable location to place the Temptationless Bank, like a table (away from the edges) or better yet, the floor since it can weigh up to 150 lbs. when filled. Benny holds his microphone to announce that bidding will begin soon! Moments after the first purchase. It was so fun and quite hilarious to watch this toy auction take place. Most importantly, Benny added a few more dollars to his savings. He later asked that I carefully place his Temptationless Bank on the right side of the floor, next to his bed. The left side of the bed has a smaller coin bank which is where he places extra coins and bills in case he needs cash for dollar store purchases or ice cream treats! Notice Benny's Temptationless Bank on one side of his bed...hehe! Saving for a rainy day is always important! The awesome mompreneur who developed this product also offered a great suggestion: keep a Temptationless Bank inside the laundry room since that's where a lot of loose change ends up! If you notice above, buying more than one of these actually saves you money (go figure!). They go for $29.97 for one bank, $25.97 each if you purchase two banks and $22.97 each if you purchase three or more. Now let's order some Temptationless Banks and save some cash money...yesssssss! Thanks for reading friends and Happy National Financial Literacy Month to all!